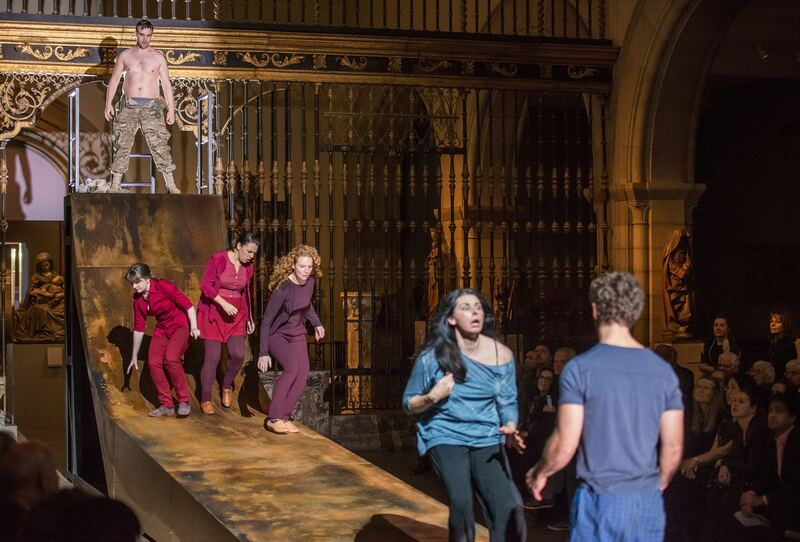 SKY ON SWINGS was commissioned by Opera Philadelphia and was premiered in September 2018 at the Kimmel Center’s Perelman Theater in Philadelphia with direction by Joanna Settle. We open on an Alzheimer’s hallucination. Martha, a woman in her seventies, sees a surreal and exaggeratedworld in which strangers torment her and weather invades her kitchen. Martha remains in the grips of her hallucination until the presence of Martha’s daughter, Winnie, rips her out of it. Suddenly, shockingly, Martha is back in the Alzheimer’s care facility where she lives. As Martha visits with her daughter, elements of the hallucination linger, complicating her ability to interact in a normal way. We meet Danny, a woman in her sixties, as her son Ira pushes her to undergo a simple Alzheimer’s test: remembering a list of ten nouns. When Danny struggles to recall even one or two of the words, she’s forced to reckon with her cognitive decline. Danny’s memory isfading but, at this point, she’s still fully able to reckon with and agonize about the bleakness of her future. SKY ON SWINGS went through many stages of development. I first began thinking about this project during my final year as a composer-in-residence of Opera Philadelphia in 2014, and these seeds of ideas took new shape when I began working with librettist Hannah Moscovitch and director Joanna Settle. But perhaps more than anything else, the music of the opera was shaped and inspired by the voices of Marietta Simpson and Frederica von Stade. There are many stories to tell about Alzheimer’s: family members, caretakers, researchers, and doctors all have unique perspectives. But from an early stage of working on this piece, I knew I wanted the focus to be on the experience of the disease: to try, as much as possible, to view the world through the eyes of two individuals with Alzheimer’s and to give voice to those characters. A caretaker I was talking to about the disease told me, “once you’ve seen one case of Alzheimer’s, you’ve seen one case of Alzheimer’s.” Part of the challenge of this piece was to try to figure out how to express the effects of Alzheimer’s in two vocally distinct characters whose experience of the disease is different. Working with Marietta and Flicka as I began to write was crucial to the development of the opera and I’m so grateful for their generosity, artistry, and openness to experimentation throughout the process of writing and work-shopping. One of the unexpected joys of writing SKY ON SWINGS was the realization that I had the opportunity to write music that could not be sung by younger singers. The wide range of sounds and subtleties of expression that Marietta and Flicka are able to create provided a wonderful sense of freedom for me as a composer as I searched for moments of both strength and vulnerability, and moments that could suggest in an expressive way the deterioration Alzheimer’s causes. This is particularly true of the Martha character, who is in a more progressed stage of the disease, and who vocalizes in a way that some Alzheimer’s patients do as they are losing the ability to speak. In the music of the orchestra and the four Elders, I wanted to create an unstable sonic world that is moving and shifting, as if one were aboard a large creaking ship, slowly rolling in the waves. Sometimes the music gets stuck on repeat but mostly it keeps slipping through one’s fingers, with recognizable phrases, gestures and almost remembered quotations appearing briefly before evaporating. As the orchestral music fractures and disintegrates through the course of the opera, the voices of Flicka and Marietta become a constant, cutting against the deterioration of the instrumental music. As I worked I kept returning to this question: Does the disease change who we are, or does it reveal in some way our deepest selves by stripping away layers? I have heard or read many of examples of both: the pious aunt who develops a cursing habit, or the immigrant father who sings perfectly the songs of his youth even after he has lost all other facility to communicate. This was a central question for me as I thought about how the characters of Martha and Danny would be expressed and developed through music. But as I neared the end of the opera, this question seemed to diminish in importance and the music I wrote for the two took on a life of its own, inspired and carried by the deep sense of humanity that Marietta and Flicka are able to project through their voices.